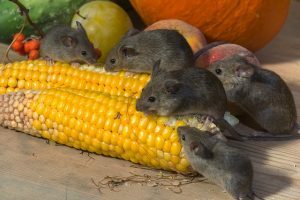 Each fall, the onset of cold weather causes mice to search for food and shelter. Mice will enter any hole or crack as small as ¼-inch. look like a loosely woven ball 4-6 inches in diameter. If food is available, a mouse will normally travel no more than 10-50 feet from their nest. Because of their poor eyesight, mice navigate using their whiskers, usually traveling along a wall or other object. If you don’t move, a mouse can’t see you. Have you ever seen a mouse run while you were watching TV. You were not moving, the mouse didn’t notice you .